for a completely different look each time. were just the right size to cover with some pearls over for a different look. Well I'm off to play some more, thanks so much for stopping by! Salutations! Where has all the time gone? I'm back with another post, this time with Buzz and Bloom's latest goodies!!! We're all in for loads of fun! On first look, these ladies are not shapes that I will usually scrap with. However, that's where I was proven wrong! What better than to get all reflective and consider my role as a woman, especially leading up to the month of May when International Women's Day is celebrated! Being one in a million women, this page has no pics, but my thoughts on the different roles I play - Wife, Mum-to-be, daughter, sister.... What I really like about the Chipboards is the mood and shapes they bring to the page. See the background? Using the chipboards, I first misted them, then traced their silhouettes and finally attached them to the page. So my challenge to you this month is to think out of the box, use a totally different product and journal your thoughts on your creations! Today I would love to share with you a layout of my Anabelle. Doesn't she make a cute little nerdy cat? lol. So, for this one, I based it around the **NEW** CB Ornamental piece. It was a little long for my A4 sized layout, so I simply snipped the end off, and kept it to use on a future layout. I painted it up in a mixture of green, and yellow acrylic paint, dabbed on to add a little bit of texture. I'm maybe one of the laziest scrapbookers in the world, I rarely measure anything, don't use a cutter of any sort, and often do not use paint brushes, and paint with my finger dabbed in the paint, this is a great way to get the dabbed textured effect! For the "huh?" title, I used a CB Wham Bang Ouch which was painted, and then outlined a little with a sharpie in the indents, to make it stand out more. A little ACR On Cloud Nine - Fluro Green as well as some ACR Up The Garden Path - Ruby flowers finished off the layout perfectly. Thanks for stopping by the Buzz and Bloom Blog! Being on a manufacturer's design team has to be at it's most exciting when they release new products, right?! You get to be among the first to take them for a test run and have a play! If you havent seen the amazing new products yet, make sure you get over to the website and do so! They are so fun and funky and unique! For this layout, I got to play with the new CB - Buttons and CB - Daffodils as well as a few of the other delicious pieces in the B&B Catalogue! The CB - Daffodils didn't really have a girly floral feel to me, they're not as swirly as some of the other new release floral chipboards, so I didn't want to create anything too prissy. Instead, I used them to echo the shapes of the waves in a photo I had with the ocean in the background! With a little bit of texture (made by dabbing the paint on with a brush as opposed to brushing it on), the shape was perfect! In keeping with the blues of the page, I coloured some CB - That 70s Alpha with some regular coloured pencils for my title. I have tried this on another beach layout I've done and I love the weathered look it gives, perfect for anything oceanside! I like to colour the alphas before I pop them out of the sheet, it makes it a lot less fiddly and easier to control! The new CB - Buttons were just such a perfect little touch. They are so versatile and I think you could do almost anything with them, I chose to ink some of the smaller ones and paint the larger ones to match. I mounted the whole thing on a base I had prepared from a sheet of patterened paper and an acetate window, which provides a see through window and sets off the acrylic pieces nicely and draws attention to all of my little chipboard pieces! I had so much fun playing with all of the new bits and pieces and I can't wait to make a start on my next project! Take care and thanks for looking! It’s so amazing to see how seamlessly all the Buzz and Bloom products look like when they come together in one layout. For this layout I’m presenting to you, I used all the product range available and I’m super satisfied with the outcome. So you see, feasting on the varied B&B products is indeed like a buffet! So go, dig in, Indulge yourselves! I just recently went on a two week road trip with two very good friends of mine who I have known for over 15 years. We had a couple of moments where I think a break would have been *very* necessary, but overall the trip showed me how much their friendship means to me. So when one of them sent me some of her photos from the trip, I knew I wanted to scrap a layout about it for my third project. Again, the CB Beaded Curtain Border sucked me in. This time, since my holiday was almost entirely oceanside, I wanted an aquatic look. To get this effect, I painted a white base coat and followed with a light sponging of watered down blue paint and layered it over an ACR Lava Lamp (Now discontinued, sorry ladies!). Next I painted my CB Vette Upper Case Alpha with a solid coating of the same blue paint and stitched them onto the layout with white cotton to compliment the beaded curtain strip. So after my first month on the DT and three layouts in, I have to say I am LOVING my test drive of every product I've used! Everything is so much fun and so versatile! Hope you're all well, and happy scrapping! Most crafters approach the use of the Buzz and Bloom acrylics with much trepidation. Fear not! Let me tell you something about using these pretty, shiny things. You must agree with me though, it looks amazing this way, ey? Experiment with your raw Buzz and Bloom chipboards today... surprise yourself! Hi again! 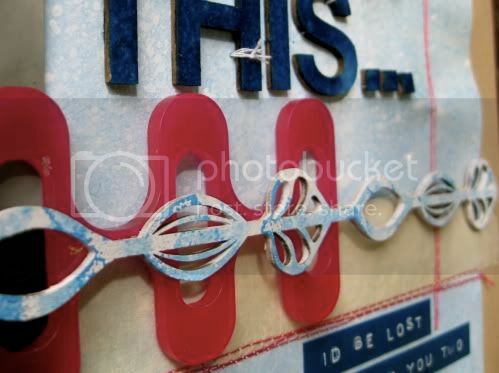 I'm back to share another layout I created using some of the fun Buzz and Bloom chipboard products! 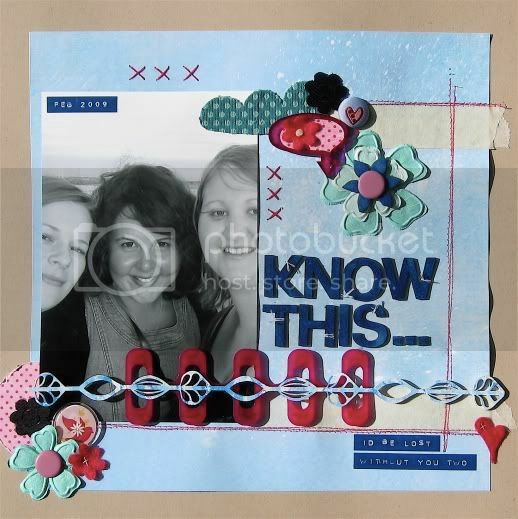 I'm sharing a layout that documents the wonderful friends I have made through this wonderful hobby called scrapbooking. It's constant fun whenever we get together, whether it's to sit down and crop or to have some coffee at the local Starbucks. I created a cluster of handmade flowers to the lower left of my photo and to add accents to the cluster, I used the CB Retro Leaves that I misted green and covered in Glossy Accents. The title for this layout is from the CB Distracted Schoolgirl Alphabet set, which I painted yellow and covered it again with some Glossy Accents. 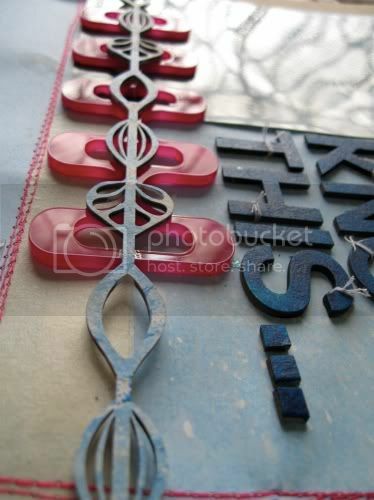 I just love the way Glossy Accents looks on top of chipboard! Hope you enjoyed this quick and fun layout! Thanks for looking! I just love the designs of the Buzz and Bloom chipboards that are available because they are so easy to use and you can use them on all sorts of layouts - flower chipboards for boy layouts and pointers for girl layouts. Like for example on this page that I have created, I was able to use the CB In Bloom for a boy layout! I just misted it with bold colors and they were perfect embellishments for my page! I also love using these very cute CB Pop Art Alphabet - Fineliner. They are already embossed, so you can leave it as is or mist and paint on it. And lastly, I also used a portion of the Den Borderline: Heart Throb - Indigo to further accentuate my page. So, why don't you start grabbing those funky or girly Buzz and Bloom embellies and challenge yourself to use them on girl and boy layout!!! They are going to be Fabulous!!! Until then!!! Thanks for looking! For the title, CB Distracted Schoolgirl Alphabet was used. Isn't it great to have a font that has a hint of a comical touch for a page of this nature? With this page, you can tell that we're totally excited with meeting bub in real life and ultimately, at the end of the day, we wish only for a healthy baby, and one who loves the Lord. So have fun with your layouts and do capture some of your inner thoughts today!